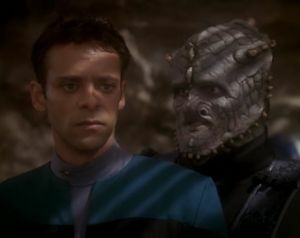 Bashir and O'Brien are captured by a group of rebel Jem'Hadar who try to force Bashir to cure their addiction to ketracel-white. Meanwhile, Worf interferes with Odo's security duties. There's some good banter between O'Brien and Bashir, followed by some pretty impressive effects work as their shuttle descends into a tropical atmosphere. I'm really glad to see the Jem'Hadar instead of some random alien species of the week. Before they show up, it feels like a pretty typical Star Trek set-up. With station security playing a major role in the B-story, why is Lieutenant Commander Eddington, the chief Starfleet security officer on board, once again MIA? Bashir and O'Brien's "cell" is nearly identical to the one Quark and Sisko are put in by the Jem'Hadar in "The Jem'Hadar." Good consistency. "You know the rule: if the death of one will make the rest stronger, then he dies." Sounds like a Dominion perversion of the Vulcan dictate, "The needs of the many outweigh the needs of the few, or the one." The moral quandary laid out by Bashir and O'Brien's disagreement is exceptionally well done. It's hard to look at the situation as black and white, as both men make a compelling argument about how they should act. However, ignoring the "larger issues" Bashir is talking about, I think I would side with O'Brien, because as Commander Data once taught me, escape is the primary duty of a Starfleet officer who has been placed in captivity. The Jem'Hadar frequently display their obsession with tactics and strategy throughout this episode, reinforcing that they are more than just mindless fighters. Is Sisko still fiddling with that clock from "Dramatis Personae"? A good episode, all around. It's good that the show is putting an obstacle between O'Brien and Bashir, forcing their relationship to change, and it's also good that they're elaborating a bit more on both the Jem'Hadar and the Dominion's inner workings. Additionally, I'm glad the writers are giving a little time at the beginning to establishing that Worf is not yet comfortable in his position, that the B-story is helping demonstrate that the rules of DS9 are very different from the Enterprise and that Worf is going to have to find a way to accept that.